Maximum Governance is an initiative of Coeus Age Consulting to start a research driven discourse on the innovative use of digital in governance. As a part of the Maximum Governance initiative, our analysts have undertaken a massive task of identifying, documenting and celebrating the Gems of Digital India. These are the e-governance projects, which have deeply transformed the way governance is carried out and services are delivered to the citizens. The Gems of Digital India are innovative in design, holistic in approach, visible in terms of their impact and sustainable over a long period. 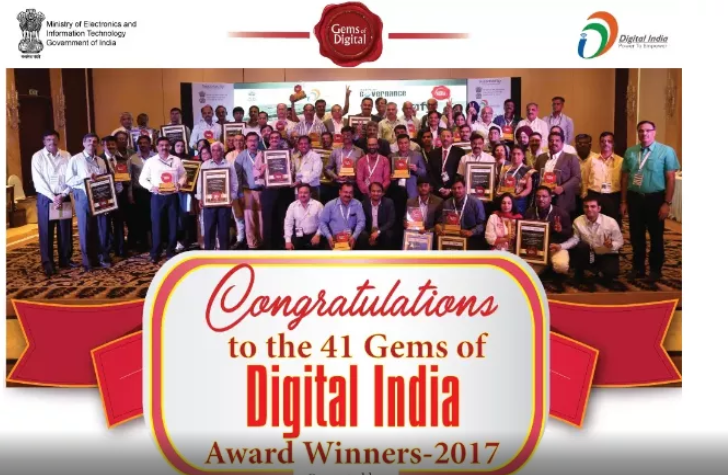 In 2016-2017, our research led to the discovery of 41 Gems of Digital India, which were presented with the Gems of Digital India Award, 2017. A book was also launched that contained a case study on each of the winner initiative. 29 of them were from the center whereas 12 were from various states. Our search did not just end there, it in-fact is continuing incessantly. Our analysts are busy identifying initiatives which are probable winners of the Gems of Digital India, 2018 Awards. The exercise involves a rigorous 5-stages process. Stage 1 – Last year we created an exhaustive listing of 1600 e-governance projects at the national as well as state levels and rated them on 5 parameters related to the project Depth and Breadth (A Maximum Governance Framework). We are continuing the efforts for further extending the database. Stage 2 – Based on the overall scores and further analysis, our analysts shall shortlist initiatives worthy of winning. Stage 4 – The final list of the worthy projects will be shared with an eminent panel of Jury, who shall then finalize the Gems of Digital India, 2018 – Jury’s Choice. There will be a separate list made on the analysts’ recommendations who shall become the Gems of Digital India, 2018 – Analysts’ Choice. Stage 5 – The winners shall be felicitated in an awards function in 2018. A case study shall also be prepared documenting their success, which shall be compiled in the form of a book. The book shall also be launched at the awards function in 2018. Watch out this space as we discover and bring to light the Gems of Digital India, 2018 Winners. Fostering Transparency in Public Procurement with the Use of Technology!